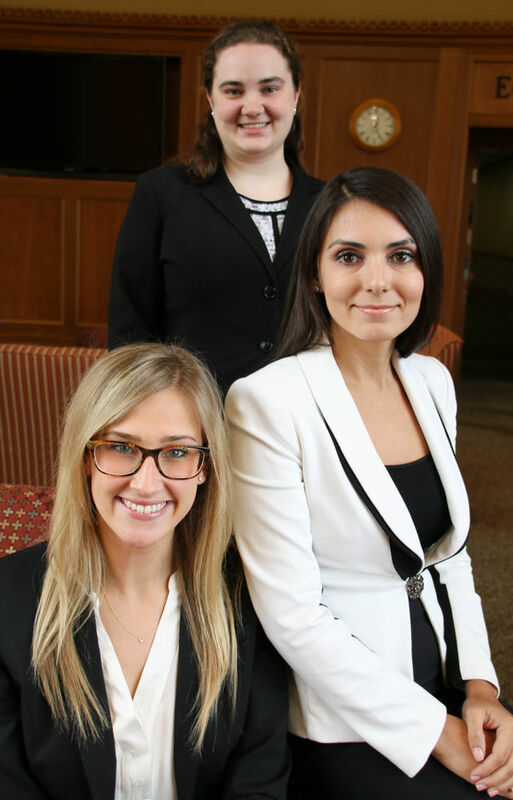 The Notre Dame Law School Program on Church, State & Society has awarded three summer fellowships to first-year law students Jessen Baker, Samantha Scheuler, and Kristina Semeryuk. Each will receive a $10,000 fellowship award to work for a religious institution in a legal capacity this summer. Baker will be working at the religious-institutions practice of the law firm Lewis Roca Rothgerber Christie LLP in Colorado Springs, Colo.
Scheuler will spend the summer at the Office of the General Counsel of the United States Conference of Catholic Bishops in Washington, D.C.
Semeryuk’s fellowship will be at Bryte Church, a Russian Baptist Church in West Sacramento, Calif. There are more than 2,000 church members who are primarily immigrants, including some with first-generation children born in America. Semeryuk said that the church currently does not have an attorney on staff because there has not been a person in the community who both understands the Russian ties and culture and holds a law degree, but in the future an on-staff attorney will be necessary. Richard Garnett, the Paul J. Schierl / Fort Howard Corporation Professor of Law and Director of the Program on Church, State & Society, said he had a strong pool of applicants for this fellowship. “This is an outstanding opportunity for these students to get exposure in the area of religious-institutions practice and explore the many legal options that combine religion in our society,” Garnett said. Notre Dame Law School’s Program on Church, State & Society focuses on the role of religion in society and how law structures these relationships. In conjunction with the University’s other colleges and centers, the program hosts conferences, workshops and other programs and is committed to increasing legal scholarship in order to promote dialogue on the interaction of these two dynamic — and often colliding — aspects of society. Originally published by Denise Wager at law.nd.edu on March 24, 2016.